Over winter break the Gannon University men’s basketball team went on a seven-game win streak, and the Knights will look to make it eight straight when they host rival Mercyhurst at 7:30 p.m. Wednesday in the Porreco Pride of Erie Game at the Hammermill Center. The win streak, one short of last year’s season-best mark, gave Gannon an 11-5 overall record and a mark of 7-3 in Pennsylvania State Athletic Conference action. A little over a month ago, the Knights were sitting at an even 5-5 record heading into a Dec. 9 matchup with host East Stroudsburg, which owned a 7-1 mark. After trailing 12-6 early, Gannon responded throughout the game and used strong defense to slowly take control. During one stretch, the Knights held East Stroudsburg without a field goal for 6 minutes, 36 seconds, and the Warriors were held scoreless for nearly four minutes, resulting in a 71-64 win for the Knights. Ten days later Gannon battled Notre Dame (Ohio) at the Hammermill Center. Building off the momentum of their last victory the Knights defeated the Falcons by double digits, 88-63. Zay Jackson led Gannon with a game-high 25 points. A PSAC matchup with Indiana University of Pennsylvania set for Dec. 30 was rescheduled for Feb. 12 at the Hammermill Center. After the postponement, the Knights posted consecutive road wins over California University of Pennsylvania and the University of Pittsburgh at Johnstown to raise their record to 9-5. Gannon’s 69-66 victory over Cal U on Jan. 3 again was fueled by its defense, as the Knights held the Vulcans scoreless for the first 3:43. Defense came in handy at the end as well, as the Knights challenged Cal U’s attempt at a game-tying three-pointer at the buzzer. On Jan. 6, Gannon’s bench played a key role in the 73-69 over Pitt-Johnstown, as reserves accounted for 26 points. Repeating this sequence with a set of two double-digit home wins against Seton Hill and Edinboro, the Knights continued their victory trek. Against Seton Hill on Jan. 8, Gannon mounted a late second-quarter 27-8 run to secure its fifth consecutive win, 75-60, in its first home game in 20 days. The run ended with two dunks from Gannon seniors Damon Miraud and Jair Green. 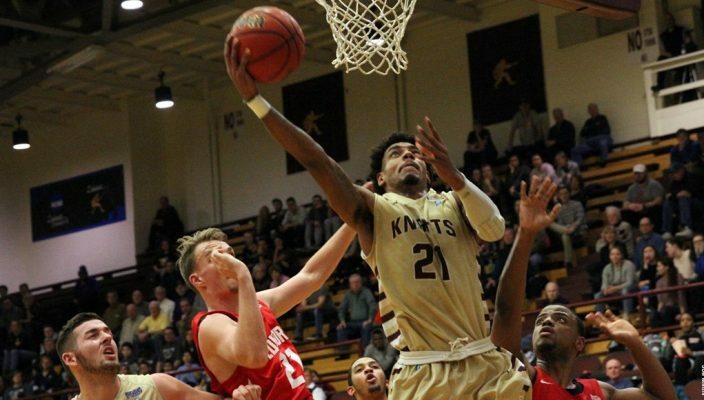 On Jan. 10, the Knights outlasted rival Edinboro, 83-69. Gannon’s defense once again proved key as it held Edinboro’s top scorer, Keshawn Liggins, to just seven points – 17 under his average, which was fifth nationally. After Edinboro found an early 7-6 lead, Gannon soon pulled ahead with a 14-point streak in the first half. Jackson once again led the Knights in scoring with 24 points. Returning to the road, Gannon visited Clarion’s Waldo S. Tippin Gymnasium Saturday and came away with an 87-65 victory. Clarion built a 20-13 lead with 11:16 to play in the first half but the Knights clawed their way back, and Frank Webb Jr.’s fast-break layup at the buzzer gave Gannon a 35-33 lead at intermission. The Knights came out hot in the second half, outscoring Clarion 24-9 in the first eight minutes to build a 59-42 lead. 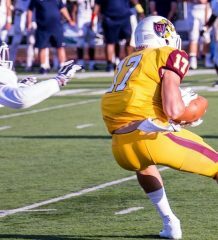 Going into the matchup with Mercyhurst, Gannon is showing outstanding offensive balance. Green leads the Knights in scoring with 14.8 points per game but Jackson is a close second at 14.4 and Evan Phoenix is third at 13.6. Phoenix is also the Knights’ top rebounder with 8.9 per game and Miraud is second at 7.6.